It might appear unusual to an outsider that Baker Perkins had, since 1927, a significant financial interest in one of its major international competitors. There had been a working relationship between the constituent companies of the Baker Perkins group and Werner & Pfleiderer of Stuttgart, Germany since the 1880s as described below but the two companies served the same international markets - bakery and chemical machinery - they remained fierce competitors, with no contact between the rival technical and commercial departments. The regular meetings between the directors of the two companies were confined to questions relating to Baker Perkins' investment and, while some sales agency agreements were in place for a limited time, these were for particular products not manufactured by Baker Perkins. It wasn’t until the early 1980s that another attempt was made by Baker Perkins to establish some cooperation between the two Companies’ technical departments; the area chosen was pneumatic handling. By this time, Baker Perkins, having started with flour handling in bakeries, (see History of Baker Perkins in the Biscuit Business and History of Baker Perkins in the Bakery Business), was dealing with applications in the chemical industries, (see History of Baker Perkins in the Chemical Business). W&P took up this overture and Murdoch McCulloch, chief engineer of the department at Peterborough concerned, visited Stuttgart to pass on Baker Perkins’ experience. There was, however, no reciprocal technical exchange before the investment was sold. Werner & Pfleiderer’s origins can be traced back to a royal patent, granted in Wurttemberg in 1873, for a universal mixing machine designed by Paul Freyburger, a staff mechanic at Stuttgart Polytechnikum. This development caught the eye of Paul Pfleiderer, an engineering student at the college, and in 1875, Paul Pfleiderer set up a business in London to sell the machine in the UK. In the following year, Paul Pfleiderer purchased the 'world rights for all time' to Freyburger’s machine for 900 marks and founded, with his brother, Hermann Pfleiderer, the Hermann Pfleiderer Machinery Company, Stuttgart to sell the machines in Germany. In 1879, Paul Pfleiderer persuaded his old college friend, Hermann Werner, who was born in the same year of 1848, to start a manufacturing company in Cannstatt, Stuttgart, to manufacture the mixers. In 1880, the two companies were merged to become Werner & Pfleiderer, Werner investing the necessary cash and Pfleiderer the Patents and value of his sales businesses in London and Cannstatt. Paul Pfleiderer continued to sell machinery imported from Cannstatt in his London business, helping Hermann Werner to develop "his" mixer on his occasional visits to Cannstatt, until, in 1885, Hermann Werner, wishing to take a closer interest in the activities of his London agent, established the London partnership of Werner & Pfleiderer. (See History of Werner & Pfleiderer (London) Ltd). The business experienced difficult times in the 1880s and, to solve his financial difficulties, Pfleiderer had to relinquish his partnership in Werner & Pfleiderer, Cannstatt and accepted a position as manager of the London Company. It was in June 1893 that the first connection with what was to become part of Baker Perkins took place. Paul Pfleiderer saw a way out of his financial difficulties and negotiated a merger with A.M. Perkins & Son Ltd to form Werner Pfleiderer & Perkins Ltd. (See History of A.M. Perkins & Son Ltd and History of Werner Pfleiderer & Perkins Ltd). Machinery made at Cannstatt for sale in Britain and the Empire was being sent in considerable quantities to Werner Pfleiderer & Perkins’ factory in Regent Square, London. Although the 'Universal' kneader had been made under licence in Regent Square, Hermann Werner took the decision in 1903 that the entire supply for the British Market should be imported from Cannstatt. This put considerable pressure on space at Regent Square and the whole of the top floor was turned into a German warehouse. This precipitated a decision to find premises with space for expansion elsewhere and the Company moved, in 1904, from its premises in London, (see Before Westwood), to a new factory, known as Westwood Works in Peterborough. (See www.westwoodworks.net). “The implication was that the firm was controlled from Cannstatt and was virtually trading with the enemy. To be sure, there was a Reciprocity Agreement with W&P ‘for the purpose of mutual advancement and reciprocal assistance covering territories of influence in sales and the control of patent rights’. But it went no further. As for German control, although one-third of the shares were held by the sons of Hermann Werner and three other Germans, the firm at Cannstatt had now less influence than it had since the formation of the company”. To help diffuse the situation the Managing Director, F.C. Ihlee formed a separate company to operate Westwood Works and present a more acceptable face to the world. The new company was registered on 1st July 1915 as Perkins Engineers Ltd, the “English” members of the Pfleiderer family changing their names to Pelmore. Throughout this period, discussions had been taking place between Perkins Engineers and Joseph Baker & Sons with a view to a possible merger of the two companies. Not many months after the outbreak of hostilities in 1914, the directors of Joseph Baker & Sons had tried to persuade the War Office to undertake, on a big scale, the mechanical preparation of dough and baking of loaves to feed the troops on active service. E.H. Gilpin was asked to set up a demonstration as soon as possible and, for speed, the Joseph Baker & Sons directors decided to invite F.C. Ihlee of Werner Pfleiderer & Perkins to join in. He jumped at the chance of collaboration and this successful collaboration led, in 1919, to the creation of Joseph Baker Sons & Perkins. Hermann Werner had established a factory at Saginaw, Michigan, USA in 1896 after successfully showing Werner & Pfleiderer’s line of equipment at the 1893 World’s Fair in Chicago. He purchased a plot of land at a modest price from the State of Michigan anxious to attract industry to what had become a derelict area. Just before the 1914 War, a start had been made on new works in Hess Street where machinery for bread, biscuits and macaroni were to be manufactured. After the death of Hermann Werner in 1906, the business was carried on by his two sons, Richard and Otto, the company expanding into machines for the rubber industry, hydraulics and artificial fibres. Entry into the drying oven business was gained through the acquisition of Richard Lehmann of Dresden. The Feuerbach site was purchased in 1905, a start on building work being made in 1911 but further work was held up by the onset of WW1. In 1907, Richard Werner bought Draiswerke, Mannheim, makers of competitive mixing and kneading machines. As was the case with the Peterborough factory, the Werner brothers’ considerable holding in the Saginaw factory had been confiscated at the outbreak of WW1 and in January 1919, an ex-Peterborough employee, George Hicks, who had worked at Saginaw during the time that it had been owned by Werner & Pfleiderer, sent a letter to F.C. Ihlee to alert him that the Saginaw factory was about to be sold. Immediately Allan R. Baker was contacted at his office in Willesden, he sent E.H. Gilpin to go with Ihlee to Saginaw and buy the factory if at all possible. After lengthy negotiations, the factory was purchased. One of the important events in the early days of Joseph Baker Sons & Perkins was the signing of the 'Credo Agreement' between it and Savy Jeanjean et Cie of Paris, who manufactured chocolate and soap machinery. Later, in the summer of 1920, the directors of Joseph Baker Sons & Perkins felt strongly that it would be a good thing to establish ‘practicable relations’ with Cannstatt and a further alliance was concluded with Werner & Pfleiderer for the exploitation of the world market for bread, biscuit, chocolate, confectionery and chemical machinery. The heads of the three businesses met annually and the Secretary of the renamed Baker Perkins, G.E. Toulmin, was appointed Secretary of the Credo, thus establishing the Company Secretary as the person primarily responsible for relations between the member companies. Basically, the Credo agreement provided that a cartel be established, each of the three companies being solely responsible for the sale of the other members’ in their respective home and overseas markets – Baker Perkins throughout the British empire, Savy JeanJean throughout the French empire and W&P throughout the former German empire. (NOTE: This three-cornered arrangement was to last until the beginning of WW2 in 1939, and in a modified form until 1963 when the holding in Savy Jeanjean was sold – the investment in Werner & Pfleiderer being retained until 1986). All this of course took place at a time when it was not illegal to divide the markets of the world, so that these companies, in an effort to stop themselves competing for the same orders in the market place, collaborated fully on the technical side, licensing each other to use their inventions. In a continuation of the Joseph Baker & Sons policy of missing no chance to offer a more complete process solution to its customers, Baker Perkins were showing W&P chemical machines alongside their own grinding, sifting and mixing machinery at the British Empire Exhibition at Wembley in 1924/25. It is assumed that some sort of sales agency agreement between the two companies existed at the time. If so, this would not be the only example of such co-operation in the market place to fill a gap in the Baker Perkins product line. (See The Werner & Pfleiderer Agency below). “A further £60,000 of Ordinary Shares has been allotted to “Fides” Union Fiduciaire of Zurich, and the proceeds of this issue and of the new Preference issue have been used by “Fides” to acquire a block of Preference Shares and an interest in the Ordinary capital of Werner & Pfleiderer of Cannstatt, Stuttgart, Germany, who are the acknowledged leaders in the construction of bread and other Food machinery on the Continent. Your company has had a happy working arrangement with this business for some years, and your Directors look forward with confidence to good results from the closer association thus entered into”. A Kommanditgesellschaft (a partnership with at least one partner having limited liability) was formed in which Richard and Otto Werner still remained the personally liable partners, responsible with all their assets for the liabilities of the company and Baker Perkins became the Kommandit partner (limited partner) with a liability limited to the stake that it took up. The mutual exchange of ordinary shares came with a special agreement that, should the two countries ever find themselves at war again, these ordinary shareholdings were to be extinguished but Baker Perkins was to retain its preference shareholding of RM 4.2M. That happened on the outbreak of war in 1939. Because of the foresight of the Company’s advisers in 1927, Baker Perkins’ investment in W&P was held by a Swiss trust company, Fides of Zurich, which company and not Baker Perkins was registered in Germany as the Partner in Werner & Pfleiderer. The Partnership Deed then, like the one that later superseded it, owed much more to the form of a company limited by its shares than to a private partnership. It contained provisions for a partners general meeting similar to an annual general meeting, a Verwaltungsrat (or board of directors) and a Direktion (or board of management). In 1927, Cannstatt employed 500 with 700 at Feuerbach, generating annual turnovers in 1928 and 1929 of 14 million and 18 million Reichsmarks. Following the world crisis that began in 1928, turnover in 1931 had fallen to 8 million marks and to 5 million marks in 1933. Staffing fell from 1,350 people in 1929 to 550 in 1934, however, this numbers employed rose by the outbreak of war in 1939 to 1,200 with turnover increasing to 14 million marks in the same year. From the start, this investment began to pay off. In 1928 the directors announced that “Your Company’s profit share in this private partnership for the year is the equivalent of an 8% Preference Dividend and a 15% Ordinary Dividend on the amounts invested”. However, the world depression and political changes in Germany soon ended this happy state of affairs. The Annual Report and Accounts for Baker Perkins for the years 1930 to 1932 stated that W&P was suffering greatly from lack of sales and political upheaval. Although trading conditions improved from 1934 until 1939, Baker Perkins was allowed by the Nazi government to receive very little of the profits due to it. W&P suffered considerable destruction during the 1939-45 war and it was not until the currency reform and release from Allied Military control in 1948 that recovery started and contacts with Baker Perkins resumed. By 1951, it had built up employment to pre-war levels. Dr, Otto Fahr (the chairman of the board of management) had been in a de-nazification court charged with being a member of the Nazi party and constructing cremation ovens for the concentration camps. Both charges were manifestly false. It was proved that he had never supported the Nazis, had in fact been a member of the 1944 Hitler plot, and had used his considerable influence in the city of Stuttgart to thwart Gestapo demands to destroy all of the city’s public utilities. He had personally ensured that scores of slave labourers sent from Savy JeanJean, Paris, ended up working for W&P - as they testified in his defence. With Baker Perkins’ strong support, he was encouraged back into W&P by the partners granting him a 12.7% shareholding. As has been mentioned earlier, there were regular meetings between the managements of the two companies to discuss matters affecting the return on Baker Perkins’ significant investment in the Partnership. G.E.Toulmin, Baker Perkins’ company secretary, who had been deeply involved with fostering the company’s relations with its continental associates, passed away in 1953 having served the company for thirty-two years. R.H. Wilkins took on this task jointly with J.S. Hardy until the former’s retirement in 1975, when J.S. Hardy took over as a member of the Board of W&P. When Baker Perkins made the investment in 1927, it cemented the close trading relations of the Credo agreement. Later, national and international laws put an end to sharing of markets and designs between competitors and, as stated in the Preamble to this history, the two companies met as fierce competitors in all markets of the world. Nevertheless, a unique situation was enjoyed where the two competitors could regularly sit down quite legitimately and talk, compare information and statistics and exchange visits on such subjects as production, computer techniques, administration, apprentice training etc. A new partnership deed was signed in 1958. The Partners in general meeting were allowed to make alterations only by a unanimous vote, a two thirds majority being required to deal with other important matters such as granting or refusing the right to a Partner to become a member of the Advisory Board or of the management; the election and dismissal of members of the Management: increasing the capital; sale of the undertaking; dissolution of the Partnership etc. The Deed provided for a Verwaltungsrat or Advisory Board consisting of five members, one appointed by each of the three German partners and two by Baker Perkins. Thus, although a minority partner with only 26.1% of the capital, Baker Perkins had 40% of the votes in the Verwaltungsrat. Importantly, however, the partnership deed contained a provision that if ever the preference dividend was in arrears, each of the Baker Perkins members of thee Verwaltungsrat (board of directors) should have two votes. As no preference dividends had been received since 1939 and (see below) were not expected for some years, this effectively meant that Baker Perkins had control of W&P. The Baker Perkins directors however used this power sensitively as it considered that the best policy was to help W&P to get back on its feet as soon as possible. It was a prime mover in persuading Dr. Fahr to come back in to the management and always insisted that one of its seats on the Verwaltungsrat should be held by a leading German industrialist who could advise Baker Perkins on the intricacies of German industrial law and practices. Because of the need to be seen as strict competitors, the German partners objected to any publicity being given to the fact that W&P was partly owned by Baker Perkins and from 1956 onwards the Annual Report and Accounts of Baker Perkins only referred to an “investment in a European Limited Partnership”. Nevertheless, “friendly” competition went so far as the signing of an unofficial “Memorandum of Understanding” that neither of the two parties would seek directly to sell into the home territory of the other and this was monitored and observed. It is worth digressing at this point to mention that Baker Perkins acquired its own executive aircraft, (see The Company Aeroplane), this was used for its maiden flight in 1960, by A.I. Baker, R.H. Wilkins and J.S. Hardy to make the trip from Peterborough to Stuttgart for one of their meetings with W&P. This trip was not without its "interesting moments", a poem being composed to mark the event. “According to legal advice, Werner & Pfleiderer is a Subsidiary of the Company during such time as the dividends on the Company’s holdings of Preference Capital in that German Limited Partnership are in arrears. The last Balance Sheet adopted by the Partners was the closing Balance Sheet in Reichsmarks as at the 20th June 1948, the date of the German Currency Reform, when the Preference Dividends were in arrears from 1944 onwards. Based on the Preference Capital shown in the Balance Sheet, the arrears of Preference Dividends to the end of 1952 total 2,268,000 Marks, to which no sterling value which is not misleading can be attributed at present. An opening Balance Sheet in Deutschemarks as at the 21st June 1948, is at present under consideration by the Partners. Because of substantial losses suffered during the war, a reorganisation of the capital structure is under consideration and it appears unlikely that the arrears of Preference Dividends will be paid." A programme was conceived whereby Baker Perkins took over all W&P’s losses and all future profits were to be channelled to Baker Perkins until the losses were wiped out. This was to the advantage of Baker Perkins tax rate of 50% as against the 80% rate applicable to the German partners. It might be wondered why, with W&P on its knees and Baker Perkins in control of the Board of directors of that company, Baker Perkins did not take more advantage of the situation. Possibly because of its Quaker background and philosophy Baker Perkins adopted a “good Samaritan” role, but in practical terms, the increasing anti-cartel and monopolies legislation being introduced at that time in Britain and Germany made a complete merger questionable – and the German partners with the majority of the shareholdings would not have allowed it. But, and most importantly, the German partners agreed to permit Baker Perkins to convert some of its preference capital into a 26.1% ordinary share in the profits of W&P. W&P continued to increase their turnover and profits and, in1955, paid a Preference Dividend – the first since the War. This had the effect that Baker Perkins’ control of the Verwaltungsrat reverted from 80% to 40%. Comment on the investment in the European Partnership disappeared from the company’s Annual Report after 1956 – a footnote in the 1961 Report under ‘Associated Companies’ simply confirming that “Baker Perkins had important investments, but not a controlling interest, in a company in Germany”. The 1964 Annual Report put the investment in the ‘Limited Partnership’ as “26% and 100% of Preference capital”. “The capital and unremitted profit attributable to this investment at 31st December 1968 amounted to approximately £1,736,000 (£1,608,000). Prior to 1st January 1962, income was taken into profit only to the extent of remittances received”. Around 1968, W&P parted with their then agent in the UK, Kimball and Company, and appointed Baker Perkins to act as agent for the W&P range of continuous compounding machines for processing thermoplastic polymers such as polypropylene, polystyrene, polyethylene, etc. (See also – History of Baker Perkins in the Chemical Business). 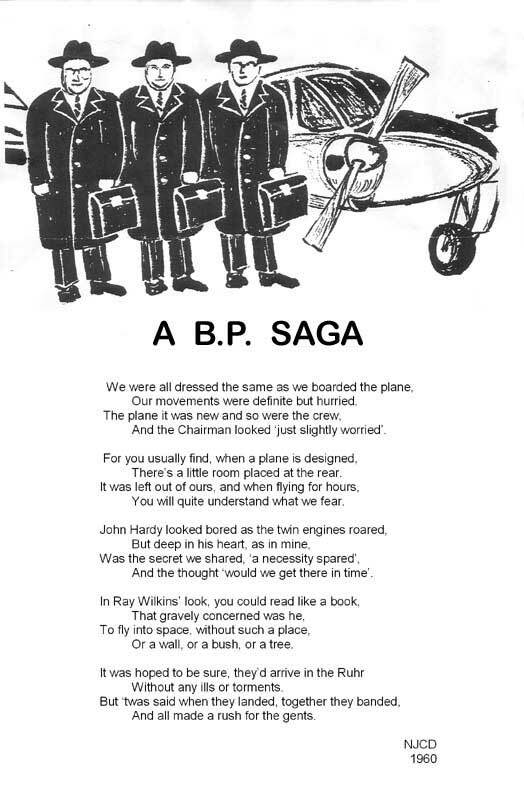 In 1974, the decision was made by BP to disengage from the WP agency agreement in the UK and WP subsequently set up their own subsidiary company in the UK, which continued to offer machines imported from Stuttgart. The major differences between British and German accounting practices created considerable problems when producing consolidated year-end accounts, with the finalisation of Baker Perkins’ consolidated accounts often being subject to long delays. In 1974, a decision was taken to change the financial year-end from 31st December to 31st March. This was in part because – "In the past the publication of the annual report and accounts has had to be delayed longer than the directors wished to wait for the results of the important European Limited Partnership to be cleared by a general meeting of the partners". “In Western Europe and most of the developing markets of the world, W&P is the most significant competitor on both the bakery and biscuit sides. Intensive study has shown that any kind of merger in the foreseeable future between Baker Perkins and W&P is not a practical possibility and therefore, our planning must be based on the firm assumption of continuing stiff competition”. “Cooker extruders represent an important new opportunity in food processing. As is the case with W&P, potentially the main competitor, the extruders themselves have been developed directly from plastics compounders”. “It was felt a year ago that the time was not then opportune to pursue possibilities of unrelated diversification both for financial and management load reasons. The way things might develop with W&P was then very open and could have involved a considerable extra investment by Baker Perkins and made a significant impact on the shape of the group. This now looks most unlikely and it seems that there is chance at least before too long we may be able to dispose of our W&P holding for cash”. In the early 1980s, J.S. Hardy had several meetings with Dr. K.E. Becker, the chairman of the board of management of W&P, to discuss the possibility of merging the two companies into one, with all food machinery production becoming the responsibility of Baker Perkins (together with packaging, printing, foundry, etc) and W&P being responsible for chemical and rubber processing, drying ovens, etc. The structural, financial and personnel problems, together with the likely opposition of the British and German Monopolies Commissions caused the idea to be abandoned. During the 1970s and 1980s, the directors of Baker Perkins were between a rock and a hard place. On the one hand the Germans were resolutely opposed to their customers and the public knowing that their largest competitor had a large stake in the company; on the other hand, the London Stock Exchange and British accounting conventions insisted that full publicity be given to all investments and sources of income – particularly as in some years W&P dividends accounted for up to a third of Baker Perkins group profits. Twice a year, the senior management of Baker Perkins met in London with their major stockholders and financial analysts, many of whom had done their homework and found that W&P had regularly been named in the Company’s Annual Report and Accounts prior to 1955. They were sympathetic and went along with the company’s predicament, but the pressure for disclosure increased and the directors of baker Perkins were forced to conclude that a sale of the investment was the only solution. Paradoxically, this decision did not please the German partners as they realised that any new partner was likely to insist on complete control of the company and would interfere far more in the business than had Baker Perkins. That is in fact what happened as, after the German Monopolies Commission had approved the sale of all the partners’ holdings to Friedrich Krupp GmbH, much of the chemical machinery production was transferred out of W&P’s factory and Krupp marginalized the production of food machinery. “On 2nd January 1986 the consideration from the sale of the group’s investment in Werner & Pfleiderer KG of Stuttgart was received from the purchaser Fried. Krupp GmbH of Essen. The investment had been made in 1927 to cement trading relationships between our company and Werner & Pfleiderer but with the demise of such links over the past twenty years, the directors decided that it was no longer appropriate to retain the investment. The difference between the sale price and the value at which this investment was held in the group’s books has been accounted for as an extraordinary profit”. The sum attributable to the disposal of the investment in W&P was put at £3.169M. By the 1980s, in terms of numbers employed and turnover, the W&P Group was slightly larger than the Baker Perkins Group. As Krupp wanted to take over complete control, it is understandable that one or two of the three German partners were reluctant to give up their investments in, and management of, such a prestigious concern just because the English partner wanted to get out. Thus, because of outside pressures, over ninety years of fruitful and friendly co-operation between two world renowned companies cause the break-up of the relationship, resulting in a certain amount of disaffection amongst the former partners.